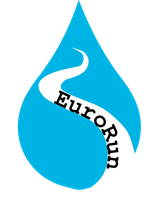 Methods - flux chambers - freshproject-euroruns Webseite! 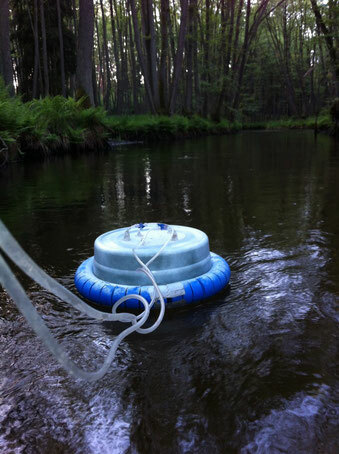 Flux chamber connected to an automatic portable greenhouse gas analyzer via tubes and freely drifting on the water (photocredit Katrin Premke). CO2 fluxes are measured at the air-water interface with a drifting chamber equipped with a CO2 sensor regularly logging CO2 concentrations in the chamber headspace. The drifting chamber consists of an inverted plastic bucket with attached foam elements to ensure flotation (Fig. 1a). The chambers will be allowed to freely drift on the water surface with the water current. During the measurements, any disturbance should be avoided that could create additional turbulence and consequently increase CO2 fluxes. Fluxes will be calculated from the slopes of the measured CO2 in the chamber headspace, which are assumed to be linear throughout the measurements. After each measurement, the floating chamber will be anchored and CO2 will be recorded until equilibrium is reached in order to measure the partial pressure of CO2 (pCO2) of the water. Briefly, those pCO2 measurements are based on the principle that after a floating chamber headspace has equilibrated with the water, the measured pCO2 in the chamber headspace represents the surface water pCO2. The construction of the floating chamber, the handling and the analysis of the data will be taught to the participants during a workshop. The direct contact with the participants and the teaching of the correct measurements ensures a reliable and comparable dataset of CO2 fluxes and other environmental parameters. Figure 1 - Illustrations of the floating gas chamber technique with (a) a schematic illustration of the setup of the floating chamber on the water and (b) an example of a linear regression from data generated by the sensor to calculate the CO2 flux (in both illustrations: water is supersaturated with CO2 and CO2 is emitted).